If you are a cake-aholic, be sure not to miss the Divine Delights Cake Boutique’s Cake Tasting & Cake Feast on the 21st of July. You will be spoilt for choice with a variety of their decadent cakes, treats, tarts and a tower of cheese with fresh fruit and biscuits. I think their slogan, “Our job is a piece of cake!”, is very fitting! 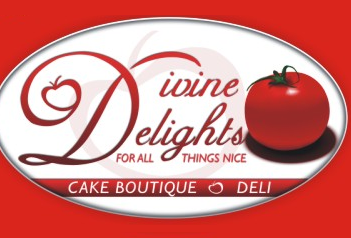 Divine Delights Cake Boutique was established in 2003 by Mien Farrell & Jenna Kearney. Their emphasis is on creating a product that is both delectable and beautiful – a true work of art! See photo’s of their divine cakes further down. Should you need any other information please do not hesitate to contact Mien or Jenna on 082 977 3747.
how to prepare everyday dairy and gluten-free dishes that are delicious as well as nutritious. You can buy gift vouchers for this event for a friend or loved-one who has food allergies. Pamela’s “Sizzling Summer” cooking demonstration will take place on Saturday 29 October 2011. She will be demonstrating 10 of her most popular summer recipes. It will be Pamela’s debut demonstration at Cooking Up A Storm, so please support her! I have had a lot of requests from clients (from both private homes and Guest Houses) who need help with ideas for plating and garnishing when entertaining, Pamela, who is a natural at this, will demonstrate how dishes can be plated with little effort and great results. She will also share her top tips for stylish and easy entertaining this summer. The venue for this demonstration is a private house in Robindale. A map will be sent to those who have confirmed bookings. To give you an idea, the venue is 3 km’s from Cresta Shopping Centre, 8 km’s from Clearwater Mall and 11 km’s from Sandton City and Fourways Mall. There is a mirror above the work area, so everyone will be able to see everything! There are still a few spaces available for Guest House Guardian’s (www.guesthouseguardian.com) fun and informative “Be My Guest” Workshop which is aimed at the Guateng Guest House and Bed & Breakfast industry. You do not have to be a Guest House or B & B owner to attend. The exhibits and cooking demonstration is ideal for any househould! Delegates will be treated to cooking demonstrations, information on grading criteria, the importance of internet marketing, choosing the correct linen, staff training and lots more. We have been inundated with bookings requests for Carolie’s Bon Apetit cooking demonstration scheduled for Saturday 30 July. This event is fully booked. The good news is that Carolie has decided to schedule another date for this demonstration to accommodate those of you who did not manage to reserve a seat for the event in July. Please see details below. Due to popular demand Guest House Guardian (www.guesthouseguardian.com) has arranged yet another fun and informative “Be My Guest” Workshop for the Guateng Guest House and Bed & Breakfast industry. Please click on the link below for more information. Joining this course will be a quick route to tried and tested recipes and save you the time and energy spent on trial and error experiments. Become familiar with the essential everyday and special occasions baking and cooking using the correct replacements to ensure products that will be enjoyed by the whole family, eliminating the need to make special food for the intolerant family member. Included in this special final demonstration will be a selection of Carolié’s favourite and best new menu ideas and recipes. The day will end with a feast of generous tasting and drinks. Book early to avoid disappointment! Carolié’s Wheat-free Workshop has been rescheduled to Saturday 16 July. Joining this course will be a quick route to tried and tested recipes and save you the time and energy spent on trial and error experiments. Become familiar with the essential everyday and special occasions baking and cooking using the correct replacements to ensure products that will be enjoyed by the whole family, eliminating the need to make special food for the intolerant family member. Carolié has decided to do this popular course on an additional date to accommodate private schools. This course can only take place if we get a minimum of 20 bookings, so if you plan to book, please do so soon and let your friends know about it as well! See details below. In this hands-on course your child will learn to cook and bake healthy but also “fun” and child-friendly food – including breakfast, lunches, light meals and more. Three 4 hour hands-on cooking and baking sessions. Includes a substantial recipe file (which will be used for many years to come! ), all ingredients and refreshments and generous tastings. Take aways – each one please bring along a lunch box for take aways. Seeing that many of you might not be able to read our April newsletter until your return from leave, we are sending you a “mid-month” newsletter to bring you up to date with changes in course dates and to remind you of courses that will take place in March and April. We still have a few places available for Carolie’s Winning Ways Without Wheat & Gluten cooking demo this Saturday (19 March) and Jeanri’s Easter Temptations cooking demo on Saturday, 2 April. Please let us know as soon as possible if you would like to book for these. Carolie’s 3-day Holiday Cookery School Hands-on course has been rescheduled. The new dates are Monday 18th April to Wednesday 20th April. The course is open to boys and girls between the ages of 7 and 17 years. See the booking form under Events for more information. Please book and pay by 4 April to secure your seats.